Mr S Sankaran was associated with the leather industry for more than 50 years. He spent his early years in Bombay and Calcutta working for a Bombay-based business house. Before establishing Indian Leather, in 1967, Mr S Sankaran had worked for Gani & Mani, an importer of wattle bark, Tannin Industries Pvt Ltd which was then renamed Raitan Pvt Ltd, and he was also one of the Directors of The General Enterprises Pvt Ltd.
Mr S Sankaran served as a Secretary of Indian Leather Fair Society, which was organizing Leather Fair, for 22 years. These two activities enabled him to occupy a ring seat and witness the exciting developments that were taking place in the Leather industry. During his career, Mr S Sankaran had initiated many activities and had significantly contributed to The Tanners & Leather Trades Association, The Leather Club, The Chemical Club besides many ad hoc bodies for significant purposes. He had written and published, “Five Decades of Leather – A Journey Down Memory Lane,” a chronicle which elucidates the important events, aspects and interesting information about the “Architects of the Leather Industry” and other pioneers of the industry. The exclusive photo gallery published in the book will surely make the readers nostalgic. 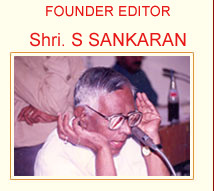 Apart from this, Mr S Sankaran had contributed articles to many Journals. Material Accepted : Digital files on CD/via email in HR pdf/eps/tiff , JPG 300 Dpi etc.